Several months ago I discovered an author on Amazon called Nicole Clarkston. She caught my attention because she was the first author I saw writing JAFF and North and South Fan Fic. At the time she had published Rumours and Recklessness a Pride and Prejudice Variation and No Such Thing as Luck, a North and South Variation. Both books had incredible reviews and ratings and when I read Rumours and Recklessness I understood why! Nicole Clarkston’s writing is extremely good and the character development is impressive, she captures their essence so well I believe both Jane Austen and Elizabeth Gaskell would have been proud of her work. I’ve started reading Northern Rain and will post the review shortly, but I must tell you, the opening scene is just incredible! So I’m incredibly happy and honored to receive, for the first time, Nicole Clarkston as a guest in From Pemberley to Milton, and I must publicly thank her not only for the availability and the generous giveaway, but also for putting so much work and time on this post with such a positive, humble and kind attitude. Today she brings a vignette she wrote and I hope you like it as much as I did, because more than that is practically impossible! Fifteen-year-old John Thornton stood before the door to the humble residence, jingling his week’s earnings in his pocket. It was not his own door at which he stood, but one just a row down. It was not a house one wished to be seen standing outside of. For a year now- exactly a year, in fact- he had assumed the role of a man, while yet a boy. He had borne the challenge stoically, refusing to cower under his feelings of shame. He was no longer a child, and he was no longer his father’s son! That regret was long past, he had spent the year assuring himself. The cares and labours of manhood were upon him, and with them, a new sense of himself. He had grown tall and broad of shoulder, and many mistook him for a young man of nine and ten. Nothing of his lost youth remained, and these days, he was feeling quite proud of that fact. New thoughts and ideas had begun to occur to him in the past months, and in the consuming fire typical of burgeoning masculinity, he had been able to think of little else. He had every right, he consoled himself- his reward for this past year. He was a man, and man had needs. His observations had informed him that he was far from the only one to bring them to this house. His fingers twitched again in his pocket, sweating now. He was most certainly not nervous. A business transaction, that was all this was; one to alleviate his cravings and clear his head once more. He could conceive of no good reason for his throat to be suddenly parched. Squaring his shoulders, he rapped on the door. It opened to him slowly, and, squinting his eyes a little, he entered. Rosemary- that was the only name anyone called her. She was in her late twenties, but the bloom had long since faded from her cheeks. She had other assets, however, which more than made up for her lack of innocence. John stared at the ample flesh bared before him in the dark little room. He was having some trouble swallowing. He had seen ladies’ evening gowns which lavishly displayed the bounties of alluring young gentlewomen, eager to ensnare a husband- but this was more blatant, even, than that. Little was left to his active imagination by Rosemary’s low-scooped bodice. The blood pounded in his ears, and in a number of other places as well. Mumbling his request, he dipped his hand into his pocket and emptied it on her little table. Rouge-tinted lips smiled, and his money disappeared. Not certain what he was to do next, he merely stood… waiting. Rosemary turned slightly away from him, and with practiced fingers, began to effortlessly free herself of some of her garments. His keen gaze caught a bare shoulder, and then a glimpse of her curved back, as her top fell. His eager hands reached out, but just before he touched her, from somewhere in the back of the house, a babe began to cry. He stopped, his limbs quivering. The fallen angel before him muttered a low curse, and urged him to pay it no mind. Perhaps her bit of professional courtesy might have lent another man all the necessary courage he required, but John’s bravado shattered. Rather than the ravishing seductress he had seen a moment ago, the young lad now beheld a tired, care-worn mother. His forehead broke out in a sudden sweat. He blinked, panting, and tried vainly to banish the righteous thoughts which once again intruded upon his conscience. The moment, however, was gone. Rosemary peered at him curiously, her bodice drooping, but John could not even bring himself to look on what he had so desired only seconds before. His breath was heaving now, and his entire being flooded with regret and humiliation. Stammering a hasty excuse, he spun out of her door and slammed it behind himself. He stood alone on the street, but this was not a place he could bear to linger. Not knowing quite what he was about, he began walking. He walked until he could breathe once more, and until the sweat had dried from his brow. He walked until he could hear the voices around him, rather than the screaming of his own conscience in his ears. He walked until he almost forgot where he was, and until the passing humanity had dissipated from about him. He hated himself. What a selfish, prideful little fool he was! He had thought to call himself a man, but a man’s honour was in the keeping of his own, not the squandering in idle pleasures. And what had he done with this week’s wages? Lost! How was he to confess this to his mother? She, who had so diligently taught him to work, to budget, to save- she, who had such faith in his honour! How was he to tell her that he had intended to throw over his integrity for a few moments of boyish lust? He could not! He looked about at last, finally recognizing where his steps had carried him. The graveyard. There was no surer place to seek his solitude, to castigate himself without the trouble of witnesses. Well… if he could not confess the truth to his mother, he would take his anger out on his other parent. His steps coming in a frenzied rush, he descended upon that fresh stone- the one he and his mother had so painstakingly saved to purchase. “You!” he snarled to the silent stone as he marched toward it. “You are to blame! For Mother’s grief, for Fanny’s illness, for the days I spend in the draper’s shop- all of it! It was your selfishness which brought this shame to us!” His fists beat upon the stone until his flesh was torn, then he slashed at the unyielding granite with a contemptuous and satisfyingly irreverent kick. Violent sobs racked him and he collapsed. He remained there, gasping through his inarticulate cries of fury, for many long moments. Conviction was slow to dawn, but faithfully, it did so. He clenched his eyes against his own disgrace. How was he any better than his father? He had nearly succumbed to his own temporal desires, had he not? He had harmed his family by foolishly squandering his hard-earned pay. What were they even to eat for this next week? Burying his face in his grime-covered palms, he raged in anguish, his youthful body shaking in the throes of his disgust with himself. After a few moments, an inspiration pricked him. It could all be forgotten- he need not return to his mother empty-handed! Furiously, he dug in his other pocket for the watch his mother had given him. His father’s- as if he wanted anything belonging to that man! Snatching it up, he nearly laughed in relief. He could sell this, fetch a handsome price, and perhaps even buy his mother that new dress she so badly needed! As he wrung the chain, shaking the watch as if it were his own father’s miserable neck, his eyes caught the time. Half past three, on the nose. It was not right, of course. It was, in fact, much later in the day now, as he had already worked his full shift at the draper’s shop. He shook the watch again, wondering why it had stopped with its hands in that precise position. What sadistic turn of events would cause the watch to pause at the exact moment when that gunshot had rung out last year- and on this day, of all days? His eyes flooded with emotion, but not a single tear did he shed. He was the only man his family had left, and a man did not do such a thing. He drew a long breath and restored the watch to its proper place in his pocket. A man did not weep, and a man did not lie. He rose, dusting off the grass from his clothing, and made his sorrowful journey home. “I think my son is a man,” Hannah answered simply. “I know, John.” She pulled the flimsy chair on which she had sat near to him. She rested herself at his side, and took his blood-streaked hand in hers. She squeezed it faintly, looking down as if gathering her thoughts. Once she felt able to continue, she locked eyes with her young man. He tried to return her smile. “I went to Father’s grave today,” he murmured, as though the two subjects were somehow linked together. Hannah’s expression fell in mute surprise. “Oh?” she replied, trying to keep the tremour from her voice. Isn’t this an amazing view of John Thornton as a teenager? It is impressive how Mrs. Clarkston captured John and Hanna’s personalities. Their actions and inner thoughts are just as I would imagine them to be in this situation and when I finished reading this vignette I wanted to know more, I wanted to know how John’s life progressed until he became a Master. I am afraid Mrs. Clarkston has created in me a curiosity that wasn’t there before, and I’m really hoping she can satisfy this curiosity in the guest posts she will have on the upcoming blog tour! To celebrate the release of Northern Rain, Nicole Clarkston would like to offer to my readers 5 copies of the book: 4 e-books and one signed paperback! The giveaway is international and to participate all you have to do is comment this post. Let us know what you thought of the vignette, the Northern Rain’s release, if you have read any of Mrs. Clarkston’s other books or anything else North and South related. The giveaway is open until the 8th of July and the lucky winners will be randomly picked and announced a few days later. wow! what a great excerpt! That was amazing. It wasn’t long and yet I was captivated. Like you, I wanted it to keep going right up to where N&S begins. 🙂 Yes, I vote for a prequel, too. Glad for the giveaway opportunity. Perhaps it’s me, but the moment I begging reading Nicole’s writing,I can see Jonh,Margatet and Mrs T. It’s not just the visual descriptions she employs,but rather her choice of words. The dialogue and inner thoughts are so appropriate for each individual character,that I’m immediately transported to the smokey streets of Milton! There’s something so very real,so authentic about her writing,that I’m totally addicted from the first page,and have no choice but to continue reading until the story’s end. This excerpt was simply wonderful! Yes,I can see Jonh being so ashamed at letting himself down,in the eyes of his mother. He is such an honourable man that to confess his yearnings would have been a source of huge embarrassment,but as we see,his sense of honour was evident,and confess,he certainly did. Loved the fact that he decided not to hate his father but chose to honour him in his own way,by thanking him for placing him, in an indirect way,on this course,on this path to a life that would be (eventually) financially rewarding,and give him an exulted place in the society of Milton. I’ve had the pleasure of reading and loving NR and indeed,No Such Thing As Luck. A prequel to NR would be delightful,I personally would love to read it!! Rita,thank you fur this post and the snapshot into John’s youth. I couldn’t agree more with you Mary! Nor could I express what Nicole’s writing makes me feel better than you did! I’m trully hoping for either a prequel, or a variation with some flashback..I think that would even be better 🙂 Thanks for your insightful comment as always Mary! Nicole Clarkston’s characters are very faithful to Gaskell’s characters Elaine, and Northern Rain is indeed a wonderful book! Loved the excerpt and I was seeing the actors from the series in my mind. I have not read any of Mrs. Clarkston’s books yet. I have ‘A Heart for Milton by Trudy Brasure’ which I hope to read soon. I really like both Nicole Clarkston and Trudy Brasures variations Vesper, and I’m really hiping they don’t stop writing so that I might have more of Margaret and Thornton 🙂 Good luck in the giveaway! I’m glad you liked it Ana! I’m sure you will love the book as well. Good luck in the giveaway! What a fantastic teaser! I haven’t read anything from Nicole but now I will for sure! Thank you for the great oportunity to meet herói Rita! What a fantastic excerpt! You can’t help but love John Thornton in North and South because he is just so honourable, but the awful circumstances that the family were left in cannot have been easy to accept at first so I’m sure he would have stumbled on his way to becoming the Mr Thornton that we love. I love the fact that he had to overcome difficulties to get where he was in Gaskell’s novel Ceri, and I think that is partly why I loved this excertp. I would love to know more of what he had to overcome to become Master Thornton. Oh my that was gripping…my heart was breaking for him. I love the depth of understanding that his other has. Beautifully written. I have yet to read anything from this talented author. Time to correct that. I think I will go check out her JAFF in the meantime. Thank you for the giveaway! Oh, you should Carole, Rumours and Recklessness is a very good P&P variation! I liked it very much as well 🙂 I hope to post the review shortly. I did read No Such Thing As Luck on kindle Unlimited and posted a review. 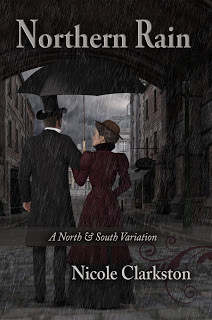 I love North and South and also would recommend “Pack Clouds Away” – another sequel of excellent quality. This vignette portrays John just as I would imagine – a man of honor, strength and integrity. I have yet to read No Such Thing as Luck, but my expectations are very high! I’ll have to check your review Sheila! Thanks for the sugestion og Pack Clouds Away! Is it available in amazon? Rita, Pack Clouds Away is another unpublished story and it is on C19.proboards.com. Many people have recommended it on various sites. Joy Dawn King also read in on my recommendation and loved it. This variation caught my eye the other day and is already on my TBR list. I love North and South and am thrilled any time I come across a variation. I am excited for another from Nicole. Wonderful excerpt. Thank you for the giveaway. I hope you like Northern Rain! And good luck in the giveaway! Looking forward to Northern Rain. Loved No Such Thing As Luck – I wish N&S variations were as abundant as P&P variations! Also loved Rumours & Recklessness. So I have read this vignette about 3 times since yesterday… I am totally smitten with this writing, it is so wonderfully enthralling! Nicole Clarkston, you, madam, ara an incredible wordsmith and I thank you for sharing your talent and passion with us. I have not read North and South yet (and I keep on going to the TV show with Patrick Swayze about the American North/South war whenever I think of it, don’t know why…), but I have scheduled time to watch the BBC series and read it as soon as possible. If the grown John is half of what you presented us with here I might just say I’m in love already! Much success with your new book and all future endeavours! Rita, once again, I cannot thank you enough fro bringing all these wonderful words and people to us here. And personally, for dragging me into this world of Fan Fiction! You’re doing a splendid work and I hope you keep on being successful and happy with blogging! I told you you would love it Sonia! The writing is amazing! I hope it gets you inspired, and please do watch the BBC adaptation, you will be as addicted as I am to these characters! Please do not enter me in the giveaway as I have already read and loved Northern Rain. Thank you for your support Janet! Yes, there are a few Kirsten. Not as many as P&P variations, but it’s a growing market 🙂 Apart from Norther Rain, Mrs. Clarkston has also published No Such Thing as Luck which is also a N&S variation. Exquisite excerpt!!! Thanks so much for pointing me in the direction of another favourite, Rita. And none of us can resist the older version 😉 Can’t wait to read more form Nicole! I think you will lke her styly very, very much Joana! I can’t wait to know your opinion once you’ve read something from her. I think this definitely catches the core of mother and son’s personalities. I’m also very curious to read about the route he took to become a master. Great excerpt! I hope I get lucky and win! I couldn’t agree more with you Tgruy 🙂 Good luck in the giveaway! Rita, you have thrown down the gauntlet! I will let you know what happens when the story and I sit down and start talking. 😉 I am glad you all enjoyed the excerpt. John Thornton is such a strong, fascinating character, and I believe that kind of strength has to be won. It would be fascinating, indeed, to sit down and explore his road to manhood. I am relatively new to North and South variations. Although from what I have recently gathered from reviews and books descriptions on amazon, the N&S world is not less fascinating and interesting than JAFF:) I read the vignette for the Northern Rain with great interest and especially loved the dialog between John and his mother, so deep and so heartfelt. I would love to read the whole book myself, but for the time being I will look forward to reading Rita’s review:) Thank you for sharing this amazing vignette and for great giveaway! For me John and Margaret’s love story is just as interesting, romantic and intense as Darcy and Elizabeth’s Oloore, and I wish there were as many N&S variations as there are of P&P, but even if there are fewer, some are very good! Northern Rain is definitely one of them! A lovely vignette with authentic dialogue. This, ” “It is not evidence of manhood to display your prowess before others. A man’s nobility is his own, independent of circumstances or prevailing opinions.””, is my favorite part and brings to mind, ““There is nothing noble in being superior to your fellow man; true nobility is being superior to your former self.”” by Hemingway. John Thornton, whom I only discovered this year, embodies many qualities I find most valuable. Thank you, Nicole. Thanks for stopping by, Tammy! I am glad you enjoyed this, it was a scene I could so clearly imagine really taking place in the early days of JT. You will be happy to hear that this scene (slightly edited) will appear in my next N&S book :-). When that will be out, I can’t say at the moment. I’m trying to wrap up another manuscript first, but it’s about half written so far. Rita’s blog will be one of the first places you will hear of it, though!